If you are wondering What to Do in 3 Days in Montenegro and What are the Best Things to See, look no further! We have built an excellent 72 hours plan for Montenegro, with information on what to do every time of the day. All the information provided is by local experts and travel bloggers. Since they live in Montenegro or go there often, they know the best that the city has to offer to you. – Exact information on which are the best hotels to stay in Montenegro, so that you will be in the best areas of Montenegro for all activities, without breaking the bank. – Information on: How to Arrive in Montenegro, The Bay of Boka Kotorska, Where to Stay in Kotor, Things to See in Kotor, Our Recommended Dining Places in Boka Bay, Useful tips on Boka Kotorska, Detailed Cetinje Itinerary with best things to see, best places to eat and useful tips, Detailed itinerary about Zabljak with all sightseeing information and many helpful tips. By getting this guide, you will feel like having your best friend in Montenegro, showing you around. It will save you time and money in a stress-free way. It will help you to enjoy the best days of your life in the magnificent town of Montenegro! 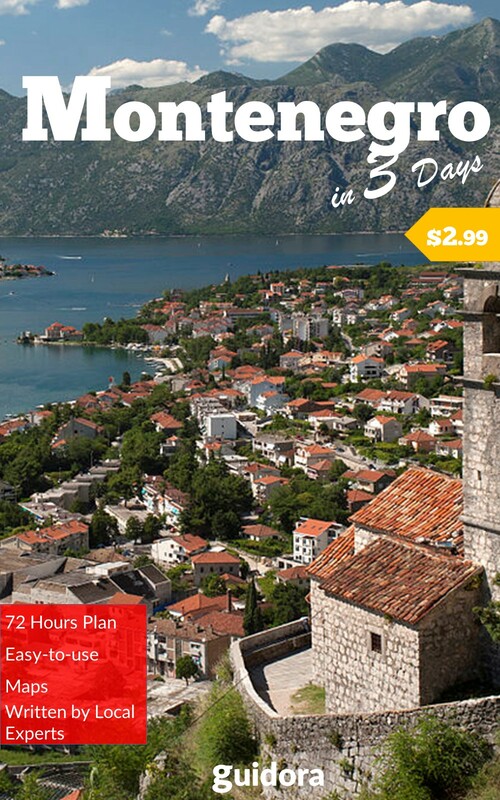 Guidora’s Montenegro in 3 Days Travel Guide, is your entry ticket to the most accurate advice on what are the best things to do in Montenegro in 72 hours. It includes a detailed 72-hour plan from the first moment you will arrive at the airport of Montenegro, until the moment you leave this amazing town. 3. All the Maps are available on Google Maps, to help you navigate Montenegro easy, through your smartphone. 7. Information in this Montenegro travel guide is up-to-date as of 2016. Get this Guide Now and enjoy your trip to Montenegro!